In No Highway in the Sky some science babble is used to explain the nature of fatigue. The explanation given depends on quantum mechanics and the metal becoming crystallised. It seems this science babble is used to avoid any controversy about the actual mechanism of fatigue. Since the author was an aircraft designer he could easy have become familiar with the contemporaneous explanation. Since the details are a topic of enquiry, inserting something outlandish is probably a very clever thing to do, it prevents inserting information which will mislead specialists and it doesn’t spoil the story for anyone else. The outlandish explanation also fits well with the main characters fascination with topics such as the mathematics of the ancient pyramids, part of the plot is that those with higher authority attempt to discredit him as a nut. They don’t want to believe there is a problem with the planes. There is deeper point which is interesting to explore — it’s not necessary for the mechanism of fatigue to be known to have a predictive theory. It would be quite possible to predict the fatigue failure from the assumption that there is some form of damage accumulation. The mention of quantum mechanics probably means the hero was familiar with the statistics of stochastic effects. Another plot point in the story is that the damage to the material cannot be seen by observation, so that inspection of the aircraft puts the main characters explanation into doubt. The failure of an aircraft by fatigue occurs by nucleation and growth of a crack. Since aluminium can be quite a tough material the size of the crack which can be tolerated before failure can be very large. Modern aircraft can be designed so that cracks can be detected by routine inspection before they reach a size which would cause failure. 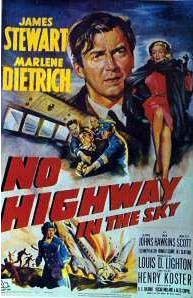 ‘No Highway’ is a book dramatising fatigue in metals, the story was made into the movie ‘No Highway in the Sky’ staring Jimmy Stewart. This is the only movie I know which is about metal fatigue. The book was published in 1948, and the movie appeared in 1951. The author Nevil Shute Norway, was a pioneer aircraft designer. The story centres around Theodore Honey, a middle-aged widower and boffin at the Royal Aircraft Establishment Farnborough (site of much fundamental work on aircraft and fatigue). Theodore is sent to investigate a previous air crash, but he realises that his theory applies to the plane he is travelling on, which he forces to land. After inspection of the aircraft on land, the much annoyed pilot is ready to take-off again, leaving Theodore Honey behind. However, Theodore’s conviction in his theory leads him to ground the plane by retracting the landing-gear. Everyone is left perplexed by his actions, except the air-stewardess and an actress aboard the plane who Theodore had convinced. Interestingly the book, in which a new airliner design being subject to mechanical failure due to metal fatigue, came before the failures of the de Havilland Comet airliner just six years later (1954). As well as the book “No Highway” and the movie, there is also the radio play made by CBS. The radio play also stars Jimmy Stewart and Marlene Dietrich.